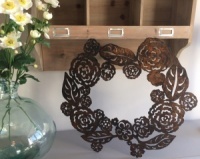 Large, hand forged rustic metalwork floral wreath by Juniper House. A unique and stunning statement piece of wallart and a true one of a kind design featuring flora and foliage in a stunning rustic finish. 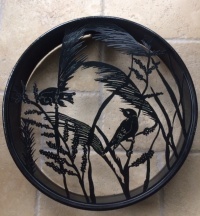 Hand forged by local artisan maker Jenny, this piece has been created using a recycled oil drum and the level of detail is outstanding. Can be displayed inside or outside.